Blackbird - 3 (1) all the new birds were juviniles, probably from the same clutch. Dunnock - 1 (1) The recap was banded 1065 days ago and is now the oldest Dunnock recaptured here. 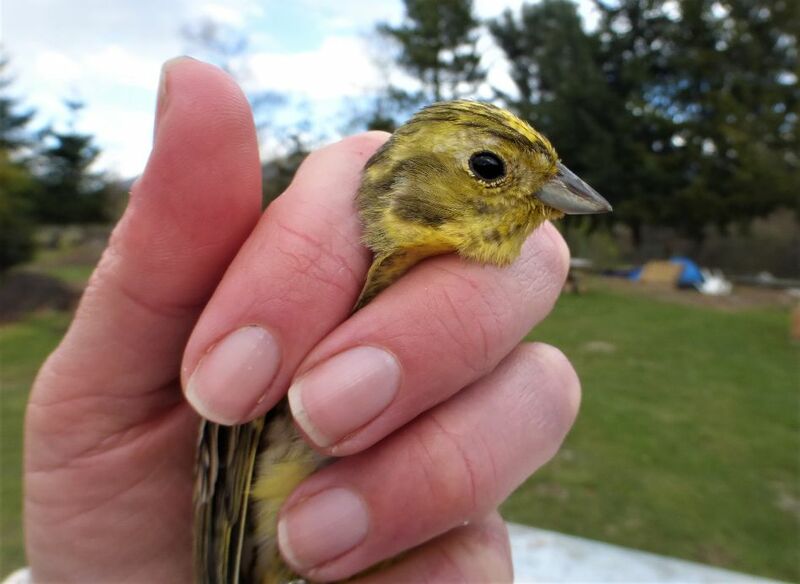 Yellowhammer - 0 (1) At 787 days from banding it is the oldest Yellowhammer recaptured. The Yellowhammer not realy old but 2+ years older than when it was banded. 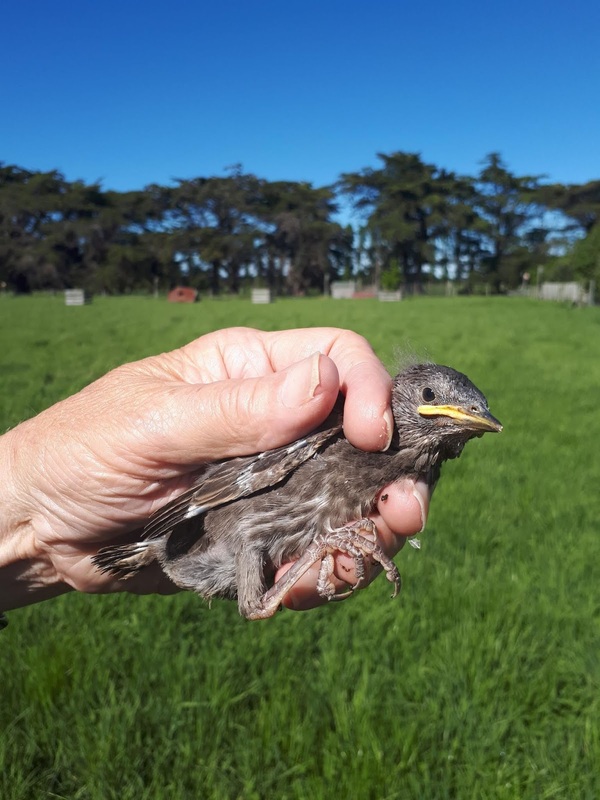 The 8th edition of the NZ Banding Office newsletter is out. It is well worth a look, if you click on the link below you should be able to accesses it. Halswell Quarry - plenty of birds but few caught. We had another quiet morning at the Quarry today (Sat 1 Jan) catching only 10 birds. The total was augmented by the banding of 3 Welcome Swallow nestlings. Greenfinch made up the bulk of the catch with 6 new and 2 recaps. The only others caught were 1 each of Silvereye and House Sparrow. There are plenty of birds about but with the wet spring there is heaps of food about and birds don't have to risk getting near the nets. The Welcome Swallow were in the same nest as those banded back in September and when extracting them from the nest it was found that one from the previous brood hadn't survived and was now incorporated into the base of the nest. Halswell Quarry, Thu 15 Nov - very quiet. We had a very quiet session at the Quarry this morning. Fewer people than usual but still far from busy. Caught a mere 10 birds of 5 species with 7 new and 3 recaps. House Sparrow 5 new and 1 recap, Song Thrush 1 new, Blackbird 1 new and recaps of Greenfinch and Welcome Swallow. The Welcome Swallow was probably the most interesting, it was caught by putting a short net across the entrance to the toilet where there is a nest. It was originally caught using the same method at the same place just over a year ago. So we now know it has returned for at least 2 springs. The Greenfinch recap about to get its freedom. The Blackbird was aged as a 2nd year bird by its retained juvenile primaries. 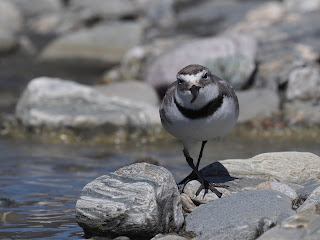 Queenstown - A few days and a few birds. Arrived back in Christchurch last night after a few days down south. Went down primarily to mow lawns and generally tidy up the place and of course hoped to catch a few birds. We had arranged for a contractor to have mown the lawns a couple of weeks ago but unfortunately due to wet weather he had not been able to and it was like a paddock of hay. On the first night it started to rain and it rained and it rained. When it finally cleared a bit I was able to get a net up for a while but caught very little. One Chaffinch and a 9 new House Sparrows and 6 recaps. One of the recaps was banded Dec 2015 and is now the oldest H Sparrow recaptured. In the afternoon a went down to the Moorhill Rd site for a couple of hours, caught 40 birds but with only 3 species there was not much variety. Amazingly caught 31 new Yellowhammers and 1 recap, this is the most I have ever caught in a session. There is a huge number there at the moment, they must be eating more chook food than the chooks. Other birds were 2 new Blackbirds and 4 new H Sparrows and 3 recaps. All 3 recaps came from the Littles Rd site ( about 2km) one recently but the other 2 were older, 1 Dec 15 and the other Jan 16. Yesterday morning I managed to get a couple of nets up for a while before we left, not a big catch but at least a bit of variety. Dunnock 1 new, House Sparrow 7 new and 3 recaps, Blackbird 1 new, 1 recap. The recap was banded in Nov 2015 just over 3 years ago and is now the oldest bird of any species recaptured down there. Also recaptured 1 Bellbird and 1 Tui. I received a message from Luke who is the Curator of the New Zealand section of the Christchurch Botanical Gardens. They had a couple of fledgling Bellbirds that were feeding in a Tree Fuchsia that they would like banded. 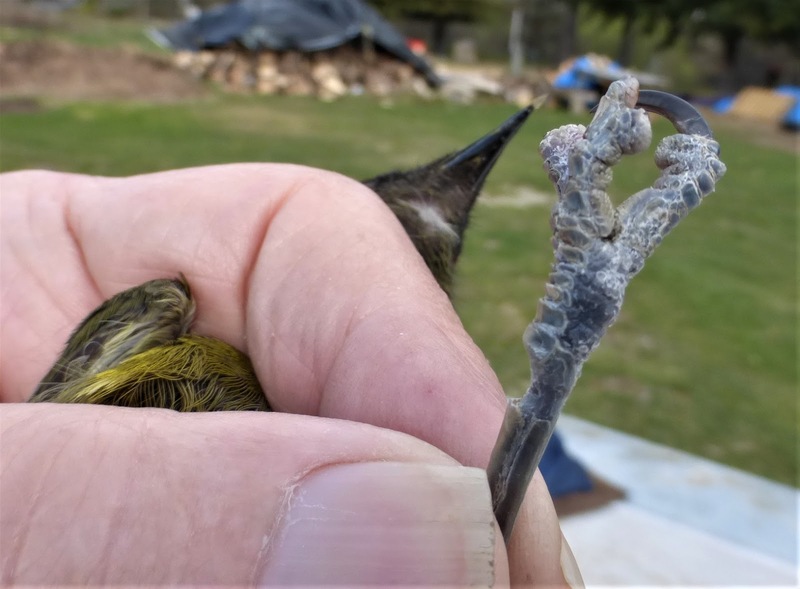 Bellbirds have only colonized the gardens in the last few years and it was decided it would be a good idea to get some banded and find out a bit about what they are up too. The tree they were feeding in was pretty big and high but we managed to get a net in a reasonable position. Managed to catch 2 fledglings and an adult male, (probably Dad). There was also at least another young bird and probably an adult female, (presumably Mum). The only bycatch was a Chaffinch. The first juvenile getting banded. The last one banded, notice the blue pollen on its chin. Fuchsia is I think the only tree that has blue pollen. Phil, one of the City Council Park Rangers who has been training with us at the Quarry qualified as a Level 2 bander a month or so ago. This permits him to band on his own with limited supervision. He has for the last few weeks been banding at his property at Motukarara in his extensive garden and small farm. So far he has banded 103 birds of 8 species, this includes a number of Starling nestlings from the numerous nest boxes he has on the property. Welcome Swallow - 3 in my decades of mist netting I have only ever caught 1 in a normally set net and Phil manages to catch 3 in his first week! House Sparrow - 56 - he must be feeding them well? Starling - 29 this includes 15 nestlings and 1 newly fledged. One of the young Starlings about to get its bling. We had a another quiet session at the Quarry this morning. Due to a number of regulars heading to Otira in search of the elusive Rock Wren there was fewer banders as well as birds. One of the probable reasons for the small catch was that this is the first time we have had a weekend session in this particular area and the number of people about was astonishing. Most of them seemed to have at least one dog of some description and most of them were running loose even though in this area dogs are meant to be on a leash and under control. Hence a considerable time was spent on traffic control. We caught a total of only 15 birds but with 7 species at least there was a bit of variety. All birds except one were new. Blackbird 1, Chaffinch 1, Greenfinch 5, Yellowhammer 1, House Sparrow 3, Silvereye 1 and 2 new Starlings and 1 recap. The 2 new Starlings were the first birds caught and the recap was the last which we were fortunate to be able to process as Andre had to make a 20m dash to prevent a woman from attempting to free the bird from the net. Greenfinch are currently in their handsome best attire. In the last few days we have two recoveries of birds killed in car accidents. A Tui that was banded at the Prince of Wales Park site in Wellington was seen to fly into a moving car and was killed. It was banded 30 Nov 2014 it was a male and aged as a 3+ so was at least 7 years old. It met its demise only a short distance from its banding site. The second recovery was a House Sparrow I found dead on the road near the entrance to the Halswell Quarry. It hadn't lived long after banding nor moved very far but it is the first recovery of a bird banded at the Quarry. The recapture relates to a House Sparrow that the group in Wellington recaptured at the Zoo last Saturday. It was banded on 13 April 2013 and although this is not old for many species it seems to be for House Sparrows as we have only recaptured about 8 older than this bird. The resighting was reported by Rachel who bands with me down near Queenstown. She was doing a braided river survey in the Makarora River which is at the head of Lake Wanaka and amongst the six pair of Wrybill was one with a band. With the aid of a remarkable photo taken by Nick, one of the volunteers, they were able to work out most of the band numbers. When this was reported to the Banding Office it was found that there was only one Wrybill with this part number sequence. The bird had been banded as a juvenile at Miranda and now as a 6year old is found breeding at the opposite end of the country. 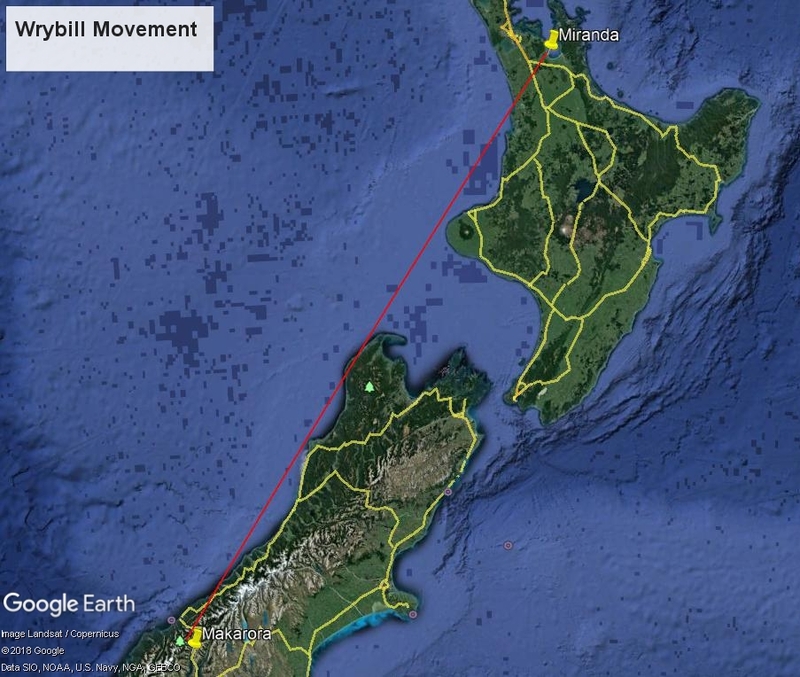 The direct line distance is just over 900km, but it is most likely to have migrated down the east coast and have stopped off for refueling at somewhere like Lake Ellesmere for a while so the actual distance flown on each trip would be in excess of 1000km. It has probably made this return journey at least 5 times. Halswell Quarry Thu 18 Oct - another quiet morning. We had a session at the Quarry this morning. It started off very quiet and although it did improve a little we still ended up with only 19 birds of 5 species with all except 1 being new. Goldfinch - 1- this bird was a female, its mate also hit the net but bounced and then perched on the top of the net. Welcome Swallow - 1- this bird is probably the mate of the one we caught a couple of weeks ago. So we presume we now have the pair banded. The tail of the bird from 2 weeks ago, judged to be female by the amount of white on the outer tail feather. Today's bird with more white on the outer tail feather and judged to be male. Halswell Quarry 30 Aug - A quiet morning. We had a relatively quiet morning's banding at the Quarry today. The nets were erected amongst the flowering gums and wattles in the Australian section where there had been a lot of birds last weekend when the area had been checked. Unfortunately numbers (esp. Bellbird) had dropped during the week. I suspect birds had moved to Kowhai trees that are now in full bloom. We were joined today by George who is down from Wellington where he was part of the group I banded with there. Also we had Andre come along. He is a South African trained bander who wants some experience with New Zealand birds. We caught a total of 24 birds of only 4 species with all but one being new. Silvereye 16, Chaffinch 4, House Sparrow 2, Yellowhammer 1 and a Bellbird recap. The Bellbird recap. The first Andre has handled (but he didn't get to band it). I had a session here this morning, same site as a couple of days ago. Again the start was delayed by damp weather but once it cleared it was all go. Caught a record number of birds for down here. 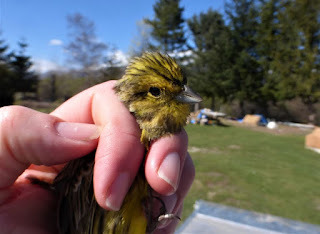 A total of 115 birds caught of 6 species with 90 new and 25 recaps. By far the majority were Silvereyes with 60 new and 22 recaptures . This is a record number of Silvereye, the previous record was set 5 Aug last year. . Two of the recaps were banded on 20 Sept 2015 they were consecutive numbers AP-16326 & 27 they are now the oldest recaptures here at 1048 days from banding. Except for one being caught the day after banding neither had been recaptured before. 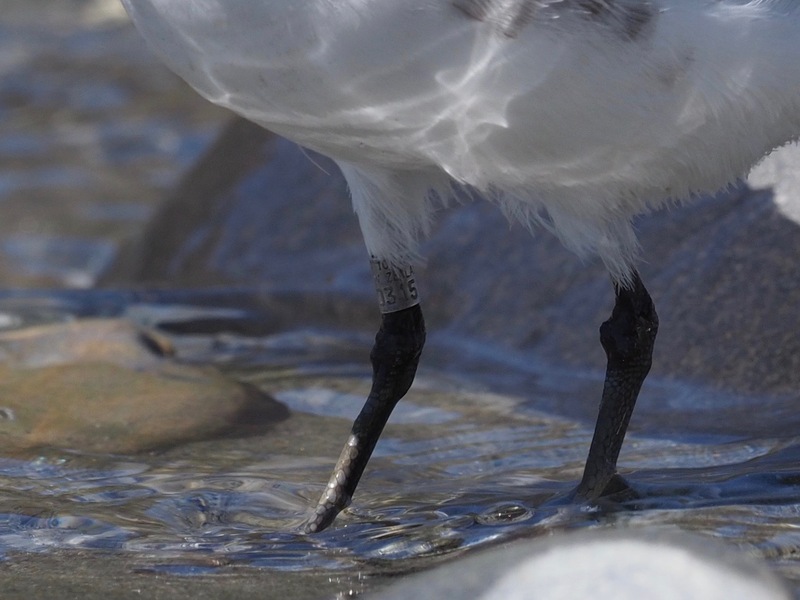 The previous record holder AP-16331 which had been caught two days ago was also banded on the same day. Another recap had been banded at The Thurlby Domain, not a huge distance just a few ks but still good to get and the furtherest we have made. The first Tui caught, a young male. Of back to Chrstchurch in the morning, then up to Auckland for a for a couple of weeks, so no banding for a while. After heavy rain started about 7.30 this morning I thought my banding plans were history. But about 9 it cleared as quick as it started and I ended up having a pretty successful day. This morning I had a double rigged net up here at a site I have been feeding for the last couple of days. Caught 55 birds of 7 species with 43 new and 12 recaps. Starling - 1 (0) The first for a while. Silvereye - 27 (12) one of the recaps was banded 20 Sept 2015 a week or so after banding started here. At 1046 days from banding is the oldest recap here. Bellbird - 1 (0) A female, the first new one for several months. The Bellbird was an adult female. This afternoon I had a session at Moorhill Rd, catching birds stealing chook food. Unfortunately I put up an extra net from the setup I had last time and this turned out to be a big mistake. There was a very poor catch rate until I took the extra net down and then it improved until I had to call it a day as darkness approached. Ended up with 19 birds of 3 species, all new except Dunnock 2, Chaffinch 8 and 8 Yellowhammer and a recap.